Pair Light Cobalt Blue & Light Cobalt Blue Satin Miniature Courting Lamp in the Moon and Star Pattern. Made New by "Weishar". Light Cobalt Blue Satin Miniature Courting Lamp in the Moon and Star Pattern. Made New by "Weishar". Old original shabby box from Weishar's warehouse. ~All pieces marked with the Weishar signature~. Weishar of West Virginia. Moon & Star Miniatures Set #4 Light Pink. These were made several years ago & don't know the date. Used in very good condition. Ready for the table for Easter, Mother's Day, and other occasions. This plate is oval and has 10 oval areas to hold 10 nice large sized deviled eggs. 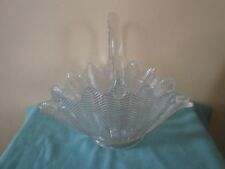 This is a beautiful heavy glass deviled egg plate in the crystal Moon & Stars pattern made by L.E. Smith. Nice crystal clear glass! Jadeite green milk glass covered fish dish made by. Pair of Jadite Jadeite Green Opaque Milk Glass Short Candlestick Candle Stick Holders. - Maker: L.E. Smith for Martha Stewart. Nice item for your collection. Weishar of West Virginia. Marked with the WEISHAR signature. This Crystal Opal owl ring tree was made by. If you buy more than one item. Weishar of West Virginia. Marked with the WEISHAR signature. This Spruce Green vase was made by. It is in new and unused condition. If you buy more than one item. With a 1970's circa is this very rare fairly lamp by L. E. Smith. The top (shell) of the turtle is blue while the bottom (body) is clear. It is 6" long and does have a scratch on the shell which you can see in the black background photos. Dark Pink Salt and Pepper Shakers in the Moon and Star Pattern. FROM A HIGH END ESTATE. For Sale is one beautiful mint conditon L.E. 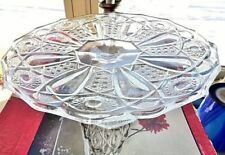 SMITH Crystal Deviled Egg Plate. Plate holds 10 eggs. It is very heavy but nothing wrong that I can see. There is an odd "swirl" pattern on one bottom, as seen in the last pic. It's not a crack, and does not appear on the inside of the bucket. The glass is clean and clear. The color is a dark aqua or a teal. Crafted in the USA. Described as Pressed /Pat Glass. New ListingL. E. Smith 20” Amberina Swung Vase - Mid Century - Gorgeous! Purchasing a beautiful L.E. Smith Amberina Swung Vase. Overall height is slightly more than 20”. 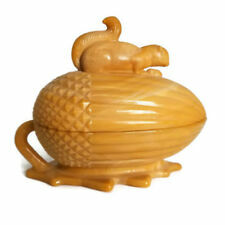 Apothecary Jar with Lid. LE Smith Blue Aqua Teal Turquoise. 10 Panel Glass Canister. Photos may have been taken with and/or without flash to depict coloring and condition and photos may depict glare. Here we have for your buying pleasure:- LE Smith Glass Jadite Hobnail Vase Martha Stewart. Good Luck. These are being sold individually. Weishar of West Virginia. Marked with the WEISHAR signature. ~Made in 2017 by~. If you buy more than one item. Rubina Carnival Bell in the Moon and Star Pattern. Has Glass Clanger. 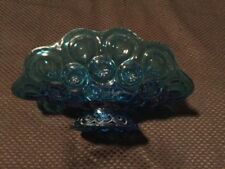 New ListingVintage COLBALT BLUE FLORAL Small Trinket Pin Dish, Ashtray Dresser 5 3/4"
Opalescent Vaseline Glass by L.E.Smith in the Moon and Stars pattern Water Goblet; Stands 5 3/4" high and 3 1/8" across the top. Great addirion to your collection for display or use. 1970's Amberina Iridescent Dish. Smith Company Hobstar Pattern. 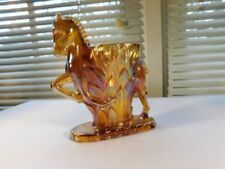 This piece is from my parents large Fenton glass collection that we are having to liquidate with their estate. Each piece was carefully chosen and loved by them. I hope that you can enjoy it also. If you have any questions or wish to see more photos please let me know. I will be sure to package with great love and care in hopes that all pieces arrive unscathed. See the last picture. They look like hairlines, but are totally smooth to the touch. I think it is just the way it is made, but wanted to point them out. If they are hairlines, they are deep in the glass and can't be felt. Pair Martha Stewart Jadeite Green Glass Hobnail Tumblers Glasses LE Smith 5-1/2"
Pre-owned, good condition on one, stress lines/tight crack by rim of the other. Selling the LID ONLY for a "Martha Stewart by Mail" LE Smith Jadeite Green Covered Fish Bowl. Condition is Used, and there are two minor chips. Please see all photos for best description. Smith made his with a ring around the base, as this one is. It's a dark green color. It features a scalloped rim, with a row of moons and a row of stars. The base is ringed with a rayed star. It can be referenced in the open salt guide, H&J #870. This is not Colonial Blue. This is a dark blue color. It is in great condition. 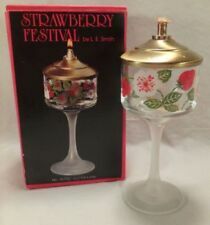 L E Smith Madonna Inn Wild Rose goblets. Designed by Alex Madonna to match the pink floral carpet at his famous Inn in San Luis Obispo, Ca. The raised rose pattern continues underneath the foot as shown. Moon And Star Crown Tuscan/Pink Opaque Jewelry Box Weishar Original Box. Condition is New. Shipped with USPS Priority Mail. 100 were made in 1997. Weishar moon and star collectible line in original box with no chips or cracks. Will double box ship. this is for a beautiful and rare item that seems to be free of any defects such as cracks chips or breaks. it is shinny and it's very colorful. It would add great to any good collection. Please look at all the pics and let me knowif you have questions. We believe this Crystal Spooner Set is a L.E. Smith reproduction of the Brice Higbee Paneled Thistle Delta Pattern. Gorgeous details. Thick, heavy glass. One is marked with a "Bee" logo in the bottom, not the Higbee bee logo. Weishar of West Virginia. Marked with the WEISHAR signature. This Jade Glow covered candy was made by. Nice uranium glow under a UV light. If you buy more than one item. It is in new and unused condition. Moon And Star Scented Oil Candle. Hand blown oil candle made for Weishar. Brand new only taken out of the box for photos. Please view all photos carefully. Stars and stripes pattern. In great condition with no cracks or loss of color. Weishar of West Virginia. Marked with the WEISHAR signature. This Cobalt Blue mini courting light was made by. Battery operated flicker light included. If you buy more than one item. ~New and mint condition~. Weishar of West Virginia. Marked with the WEISHAR signature. This Cobalt Blue frosted mini courting light was made by. Battery operated flicker light included. If you buy more than one item. ~New and mint condition~. L. E. Smith 20” Amberina Swung Vase - Mid Century - Gorgeous!